The monarchy of Tuvalu is a system of government in which a hereditary monarch is the sovereign and head of state of Tuvalu. 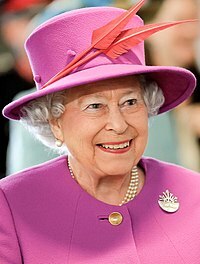 The present monarch of Tuvalu is Queen Elizabeth II,  who is also the Sovereign of 15 other Commonwealth realms. The Queen's constitutional roles are mostly delegated to the Governor-General of Tuvalu. Fifty-two states are members of the Commonwealth of Nations. Sixteen of these countries are specifically Commonwealth realms who recognise, individually, the same person as their Monarch and Head of State; Tuvalu is one of these. Despite sharing the same person as their respective national monarch, each of the Commonwealth realms—including Tuvalu—is sovereign and independent of the others. The Queen of Tuvalu and the Duke of Edinburgh toured Tuvalu between 26–27 October 1982. The royal couple were carried around in ceremonial litters and later served with traditional local dishes on a banquet. A sheet of commemorative stamps was issued for the royal visit by the Tuvalu Philatelic Bureau. In 1986 the Constitution adopted upon independence was amended in order to give attention to Tuvaluan custom and tradition as well as the aspirations and values of the Tuvaluan people. The changes placed greater emphasis on Tuvaluan community values rather than Western concepts of individual entitlement. The preamble was changed and an introductory ‘Principles of the Constitution’ was added. The constitution provides that the Queen's heirs shall succeed her as head of state. Unlike some realms, but as with others, Tuvalu defers to United Kingdom law to determine the line of succession to the Tuvaluan throne. As such, succession is by absolute primogeniture and governed by the Act of Settlement 1701, the Bill of Rights 1689, and the Succession to the Crown Act 2013. This legislation lays out the rules that the monarch cannot be a Roman Catholic and must be in communion with the Church of England upon ascending the throne. The heir apparent is Elizabeth II's eldest son, Charles, who has no official title outside of the UK, but is accorded his UK title, Prince of Wales , as a courtesy title. In the first years of the 21st century there was a debate about the abolition of the monarchy. Prime Minister Saufatu Sopoanga had stated in 2004 that he was in favour of replacing the Queen as Tuvalu's head of state, a view supported by popular former Prime Minister Ionatana Ionatana; Sopoanga also stated that public opinion would be evaluated first before taking any further moves. Former Prime Minister Kamuta Latasi also supported the idea. A referendum was held in Tuvalu in 2008, giving voters the option of retaining the monarchy, or abolishing it in favour of a republic. The monarchy was retained with 1,260 votes to 679 (64.98%). Turnout was low, with about 2,000 voters of a potential 9,000 taking part. ↑ "Slide show of Queen Elizabeth II & the Duke of Edinburgh during their visit to Tuvalu in October, 1982". YouTube (video). Retrieved 4 April 2014. ↑ "'Change in Tuvalu' - Royal Visit to Tuvalu by Her Majesty, Queen Elizabeth II & The Duke of Edinburgh, Prince Philip in October, 1982". YouTube (video). Retrieved 4 April 2014. ↑ "The Queen and Tuvalu (style and title)". Official website of the British Monarchy. Retrieved 4 April 2014. ↑ "The Queen's Role in Tuvalu". Official website of the British Monarchy. Retrieved 4 April 2014. ↑ "The Constitution of Tuvalu". PACLII. Retrieved 10 March 2014. ↑ "The Constitution of Tuvalu". Tuvalu Islands. Retrieved 10 March 2014. ↑ Farran, Sue (2006). "Obstacle to Human Rights? Considerations from the South Pacific" (PDF). Journal of Legal Pluralism: 77–105. ↑ Levine, Stephen (1992). "Constitutional change in Tuvalu". Australian Journal of Political Science. 27 (3): 492–509. ↑ Chapman, Paul (2004-05-06). "Tuvalu may ditch the Queen and declare a republic". The Daily Telegraph. UK. Retrieved 2006-06-30.